Custom Picnic Kits Personalized in Bulk. Promotional, Very Inexpensive. Budget Prices in the USA and Canada. High quality, yet inexpensive promotional Picnic Kit in bulk, custom imprinted. We also supply blank (not personalized) bulk Picnic Kits for $4.07 each. Free artwork design and Free proofs! American clients pay no taxes. The unit prices below include your 1-color custom imprint on all 3 items. We also supply blank (not custom imprinted) bulk Picnic Kits for $4.07 each. Setup Charge: $75.00 per imprint color; $30.00 on re-orders. 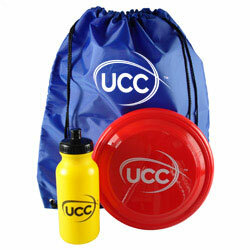 Our fun kit includes imprinted Non-woven Drawstring Backpack, 9" Flyer, and 20 oz Bike Bottle. Flyer and bottle are packed inside the drawstring backpack. Plastic frisbee, 9" diameter x 1" L /90 grams. 20 oz. Sport Bottle with Push Pull Cap. Ships assembled. Molded from HDPE (high-density polyethylene) - Recycled Code 2 HDPE is BPA Free. 2 7/8" Diameter x 7 3/4" L.
PRODUCTION TIME: 7 days after art approval; Rush 1 day production is available: add $1.25 per item. Blank items ship next day.